English cocker spaniels are happy, playful, gentle, and loving towards everyone. They like to be included in all family activities and are usually good with children. They get along with other dogs (though males may be aggressive with other males) and small animals such as cats, especially if socialized with them early. Although they may bark to alert the household of a visitor, they are not protective of their property. They do well in obedience training. The silky, medium-length coat is straight or wavy on the body, with feathering on the ears, chest, belly, and legs. Coat color is white with black, liver, blue, or red markings, roaning, or ticking; or black, liver, or red with or without tan markings. The ears are long, silky, and pendulous. The muzzle is longer--and some would say more elegant--than the American cocker's. 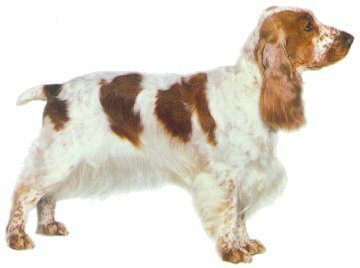 The English cocker should be brushed and combed two to three times a week and clipped and scissored every three months. The ears need weekly cleaning and the ear flaps, which tend to end up in the food bowl a lot, should be wiped off daily. The English cocker is an energetic dog that enjoys long, vigorous walks every day. The English cocker was developed in the 19th century in England to flush and retrieve woodcocks from densely wooded areas. 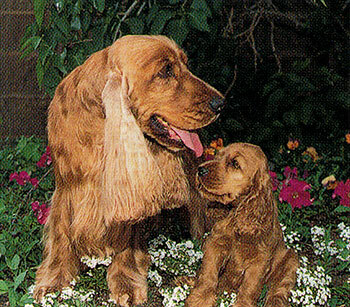 For more information please read The History of Cocker Spaniels. Breed-related health concerns: progressive retinal atrophy, glaucoma, cataracts, deafness, ear infections, undescended testicles. English cocker spaniels are happy, playful, gentle, and loving towards everyone.